Our Solid Waste Implementation Plan (or SWIP) outlines the work we plan to do over the next five years in order to align our work with the state of Vermont’s Materials Management Plan. The SWIP enables us to meet state requirements for implementing Universal Recycling (Act 148) in our region. Click on the link below to download a copy of the SWIP. The Towns of Bethel and Royalton jointly own a 22-acre parcel of land on Waterman Road in Royalton, which has been improved to provide facilities for aggregation and shipment of municipal solid waste, recyclables, and a variety of hazardous waste materials. The site also contains the now-closed landfill which used to serve area Towns from 1970 to 1993. By contractual arrangement, other Towns also utilize the waste management program, these Towns being: Barnard, Stockbridge, Pittsfield, Rochester, Hancock, and Granville. 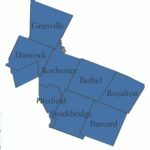 Administration of the program is done by the staff of the Town of Bethel, under the direction and oversight of the Bethel and Royalton Selectboards. As it collectively provides service to the above-referenced eight Towns, the program is formally called the “Alliance Solid Waste Management Program.” Provisions are also made by administration and facility staff to educate and expand awareness of all matters associated with proper management and disposal of any form of waste materials or recyclables. The public is invited to call the attendant at the facility with any questions.